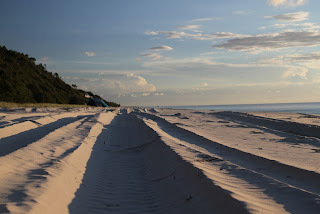 Life on Fraser Island: Cool Dingo Adventure: Sand, Sun, Spectacular setting and some good times! Cool Dingo Adventure: Sand, Sun, Spectacular setting and some good times! Fraser Island’s iconic Cool Dingo guided tour takes the hard work out of managing tides,traffic and navigation on the world’s largest sand island, and puts the fun back in toadventure touring. World Heritage-listed Fraser Island is well known for beautiful, fresh-water lakes,untouched sand dunes, ancient rainforests and the spectacular 75-mile ocean beach, whichcomes complete with a shipwreck – all of which are discovered, along with local legends and insider knowledge on a Cool Dingo tour. These popular two and three-day guided tours for 18 to 35-year-olds, were named BestExperience in Queensland for 2008 by some of the toughest travellers on the island’s sandtracks – international and domestic backpackers. Tours depart regularly from Hervey Bay or Brisbane and take in Fraser Island’s top beauty spots including stunning Lake McKenzie and Indian Head. Travellers can also grab their pack and fly from Sydney with Virgin or Jetstar (with connections from Melbourne and Adelaide).